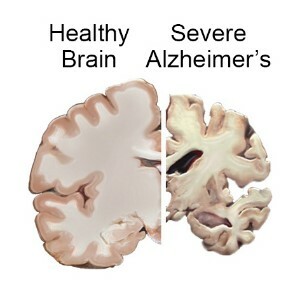 Alzheimer’s disease (AD) is the most common cause of dementia and is considered the biggest public health hazard of our generation, affecting more than 20 million people. About 135 million people will suffer from Alzheimer’s by 2050. 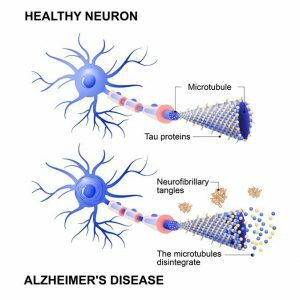 Since Alois Alzheimer reported the first case of Alzheimer’s disease in 1906, medical workers have been trying to explore the etiology of Alzheimer’s disease, and the Aβ waterfall theory has been the dominant theory in the pathogenesis of Alzheimer’s disease. 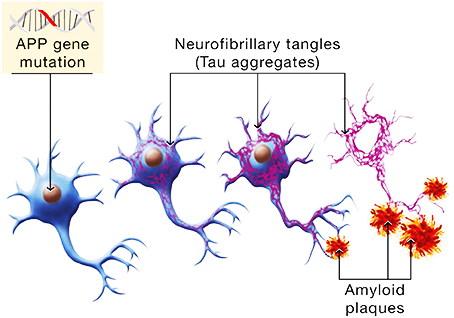 The typical pathological features of Alzheimer’s disease are deposition of extracellular β-amyloid plaques (Aβ plaques) and intracellular neurofibrillary tangles. 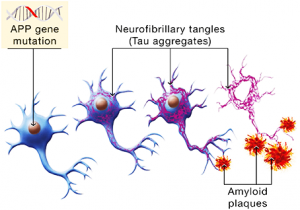 Aβ plaques are formed by the polymerization of β-amyloid protein, which is formed by the cleavage of the amyloid precursor protein, while the neuronal fibrillary tangles are formed by the polymerization of hyperphosphorylated tau proteins. Under pathological conditions, APP can form Aβ under the action of β-secretase and γ-secretase. According to the different cleavage sites, Aβ can form different length, of which Aβ 1-40 (about 90%) and Aβ1-42 (about 10%) are the main ones. At present, the toxicity of Aβ 1-42 is considered to be stronger. The theory of Aβ waterfall suggests that the toxicity of extracellular Aβ plaques leads to the hyperphosphorylation of tau protein, the damage of neurofibrillary tangles and synapses, and finally leads to the occurrence of AD. A large number of animal experiments have proved that Aβ can indeed lead to AD, which is why the Aβ waterfall theory has been dominant for more than 20 years. But at present, the clinical trials of Aβ immunotherapy have failed, which makes more and more scholars question the correctness of Aβ waterfall theory. If the Aβ waterfall theory is correct, the severity of dementia should be positively correlated with the size of Aβ spots, which is not the case. The density of Aβ spots does not increase with the progression of the disease but remains stable. About 20% to 40% of normal people have pathological changes in AD, but no dementia has occurred. There is even an atypical AD patient with clinical manifestations of dementia. The hippocampal area of the brain has a large number of neurofibrillary tangles as well as AD patients, but no or only a small amount of Aβ plaques are formed. Aβ is a nonspecific response to neuronal injury. About 30% of the patients with traumatic brain injury have deposition of Aβ in one or more regions of the brain, which is similar to the pathological findings of patients with AD. This may be an acute phase reaction after neuronal injury. Neuronal injury leads to increased expression of APP. This leads to the deposition of Aβ. APP plays an important role in maintaining the growth and survival of neurons, and its product Aβ can maintain the survival of neurons at low concentrations, promote the growth of cells, and resist the damage of oxygen free radicals to neurons. Multiple causes of craniocerebral injury, including craniocerebral surgery, neurochemical changes, and cerebral ischemia, can lead to increased expression of APP and deposition of Aβ. These results indicate that the above-mentioned reaction is a protective response to neuronal injury. After neuron injury caused by any reason, including AD, the high expression of APP is in order to maintain the stable state of the cells, at the same time, it also leads to a large number of Aβ production, Aβ deposition in the extracellular form of Aβ plaques. At present, immunotherapy against Aβ is mainly aimed at reducing the production of Aβ or clearing Aβ plaques, which weakens a protective effect on neurons and leads to aggravation of the disease. Aβ spot, tau hyperphosphorylation and synaptic damage are considered to be the main pathological features of AD. In contrast, tau hyperphosphorylation, and synaptic damage are more closely associated with AD. Tau is a microtubule-associated protein that regulates the transmission of substances from axons to synapses. Studies in AD transgenic mice or AD patients have shown that axonal swelling and amyloid plaque deposition are associated, while phosphorylated tau protein is always associated with amyloid plaque. According to the traditional Aβ waterfall theory, Aβ plaques induce tau hyperphosphorylation and synaptic damage leading to AD. However, it is also possible that neurotoxic substances induce hyperphosphorylation of tau protein and make it lose its function of regulating the normal transport of substances. Neurotrophic substances are unable to transmit to synapses, resulting in synaptic damage, and Aβ is also unable to transmit to synapses. In the transport dysfunction (that is, tau protein hyperphosphorylation) deposition, resulting in axonal swelling. Tau hyperphosphorylation and synaptic damage are the real causes of AD, and any factor that causes tau hyperphosphorylation and synaptic damage can lead to AD, that is to say, AD is a clinical symptom. There can be many causes, Aβ spot is only the result of axonal transmission disorder in patients with AD, can be used to diagnose AD, rather than a specific cause of AD. It also suggests that treatment targeting hyperphosphorylated tau proteins may improve symptoms in patients with AD. At present, there is no final conclusion about whether Aβ is involved in the pathogenesis of AD. There is more and more evidence that Aβ is not involved in the core of AD. It is suggested that there is no correlation between Aβ plaques and Alzheimer’s disease and that the formation of Aβ plaques is a non-specific reaction of neuronal damage, and even that the deposition of Aβ plaques is the result of Alzheimer’s disease. The scholars who support that Aβ participates in the core link of AD are gradually revising its theory, and think that the change of Aβ state, distribution, and nature rather than the increase of the number of Aβ spots is the real cause of AD. With the increase in AD patients, more research is needed to explore the pathogenesis of AD, so that we can overcome this disease which is harmful to human health. 1. Alzheimer’s Association. (2018). 2018 Alzheimer’s disease facts and figures. Alzheimer’s & Dementia, 14(3), 367-429. 2. Cheignon, C., Tomas, M., Bonnefont-Rousselot, D., Faller, P., Hureau, C., & Collin, F. (2018). Oxidative stress and the amyloid beta peptide in Alzheimer’s disease. Redox Biology, 14, 450-464.